As most of us saw during the recent post-bubble housing market, foreclosures can negatively impact home prices in a huge way. Although the period from 2008-2012 was extreme, the general impact a distressed property has on a neighborhood can mean bad news for surrounding homeowners, especially those looking to sell. Unfortunately, foreclosures can lower appraisal values, cause other distressed property sales, and generally tend to be an eyesore for the neighborhood. In this article, I'll discuss the many ways foreclosures impact your home's value and what you can do to minimize the damage. Once one property in a neighborhood forecloses, it's possible others may soon follow. As fellow struggling homeowners see a neighbor walk away from an underwater property, they know their home's value is probably headed down with it. This can cause a chain reaction that spreads throughout a neighborhood. The results can be multiple unkempt properties being advertised as distressed property sales, which in turn, bring the appearance of the neighborhood and property values down even further. The presence of multiple bank owned properties in a neighborhood is typically a red flag for buyers. Your traditional buyer (an owner occupant) probably isn't looking for a home surrounded by vacant properties with overgrown lawns. In addition, vacant properties are a magnet for squatters and thieves... not exactly what your typical family has in mind for their new neighborhood! Even investors looking for a quick flip or rental property may be deterred, especially if a continued decline in property values is evident. 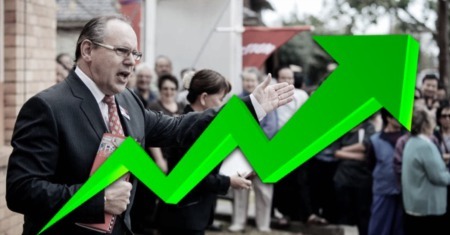 So, if buyer demand is not strong enough, properties will linger on the market and inventory will start to build up. This results in more struggling homeowners either walking away or attempting short sales. Generally speaking, foreclosed properties sell at least 10% or more below market value. They are typically sold "as-is" without any property disclosures and may have hidden damage unknown to the buyer. These unknowns, and the stigma around distressed properties, almost always result in a lower selling price than comparable "traditional" property sales. How aggressively a foreclosed property is priced may depend on the loss the bank is taking and their need to clear property inventory from their books. Different tactics have been used by banks and corporate entities to sell these properties, including: bulk sales of multiple properties, pricing extremely low to entice bidding wars, and listing them on property auction websites. Unfortunately, appraisers may use the sale of comparable foreclosed properties when determining the value of your home, especially if there are a limited number of similar properties to work with. This can mean a huge hit to your home's value, especially if similar bank owned properties are selling for a fraction of their true market value. Once this trend starts, upward valuation of properties is difficult to achieve and price depreciation sets in. So, How Much Will Your Home's Value Drop? In most areas of Metro Atlanta, agents representing buyers will use a comparable property approach to determine what to offer on a home. If there are recent sales of similar homes in your neighborhood, they will likely be used, regardless of whether or not they were distressed sales. This could bring low-ball offers if foreclosures are present. For an appraisal, distressed properties may be used as a comparable sale to calculate value as well. The appraiser will likely make some adjustments to account for the poor condition these types of properties are generally in (since typically sold as-is), but know a drastically lower selling price is going to hurt your home's value. The number of foreclosures compared to traditional home sales will make a difference as well. If you're only facing one distressed property in the area, the impact could be minimal. Many appraisers will take a general assessment of the market in the area and document the number of foreclosed property sales in comparison to traditional sales. If you're surrounded by foreclosures selling for next to nothing, you home's value will probably be right there with them. In the February 2014 foreclosure update video below I discuss the steady decline in the percentage of bank owned properties being sold in today's market. At one point during the housing bust, bank owned properties made up about 40% of the transactions being closed. If you factored in other types of distressed properties, like short sales, that number was around 65% of all property sales. 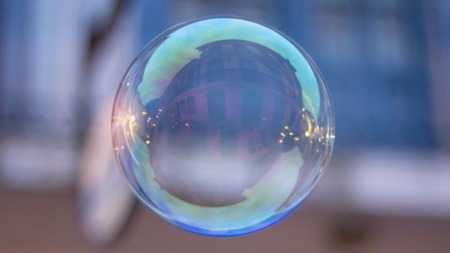 As of June 2014, the percentage of bank owned properties are only about 10% of all sales, which is a big reason the market has bounced back the way it has. The good news is, once all the distressed properties are sold and new homeowners are in place, values can start to make a comeback. 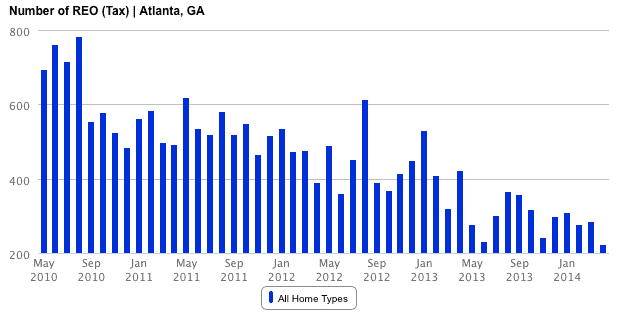 The chart below documents the number of foreclosed properties in Atlanta dating back to May 2010. 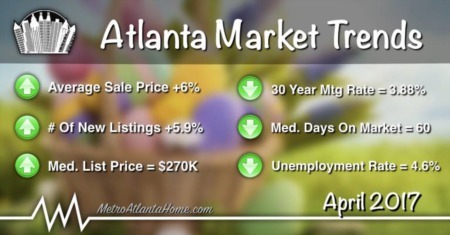 You can see how the number of foreclosures has dropped drastically in the Atlanta over the past 4 years as the economy improved and buyers gradually bought up the distressed properties. What Can You Do About Foreclosures? Sometimes timing is everything. Monitoring your neighborhood for upcoming foreclosures can give you advanced notice that one is on the horizon. Planning the sale of your property around foreclosures can make a huge difference in the selling price. 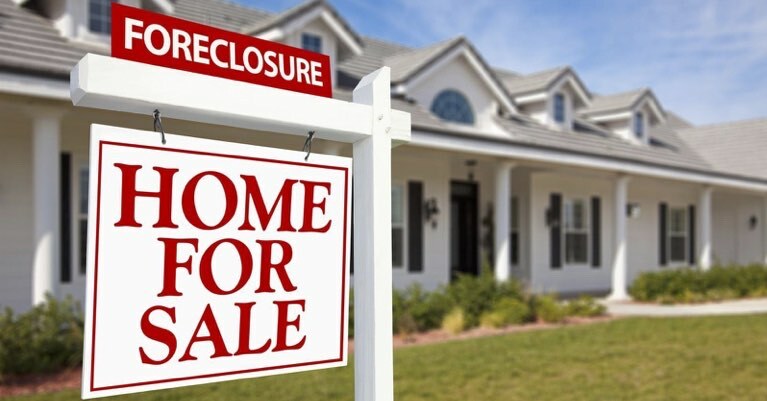 If you know a neighbor is behind on payments and at jeopardy of losing their home in the coming months, you could expedite the sale of your home to close before the foreclosed property is made public and becomes "the competition". A neighborhood could choose to help out a struggling neighbor in need. Although the struggling homeowner may not be willing to discuss why, offering to provide temporary assistance could benefit everyone in the neighborhood. Neighbors banding together to prevent one foreclosure could prevent decreased home values across the board. 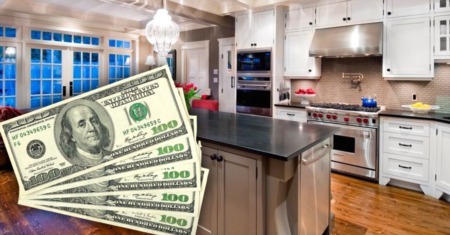 Pooling together a little money to help one person could save everyone else tens of thousands when it comes to home equity.